As we discovered in part 1, one of the big interior design trends for 2019 is based on the concept of reconnecting with nature. Homeowners are increasingly turning to more natural materials, like stone, wood, marble and ceramic, to bring the outdoors in. A bathroom with a designer appearance is much sought after, with many of us using luxury hotel bathrooms as inspiration. However, when working to a budget, you may not want to pay the designer price tags. After all, natural materials like marble, stone and wood are real luxuries and can cost the earth, not to mention the upkeep and maintenance involved in what can be a high volume room. The next best thing is to look for is something which replicates the look and feel of your favourite organic materials. Far from being a compromise, manmade materials are more cost-effective, easier to keep clean and quicker to install, and can still provide that designer finish you’re after. 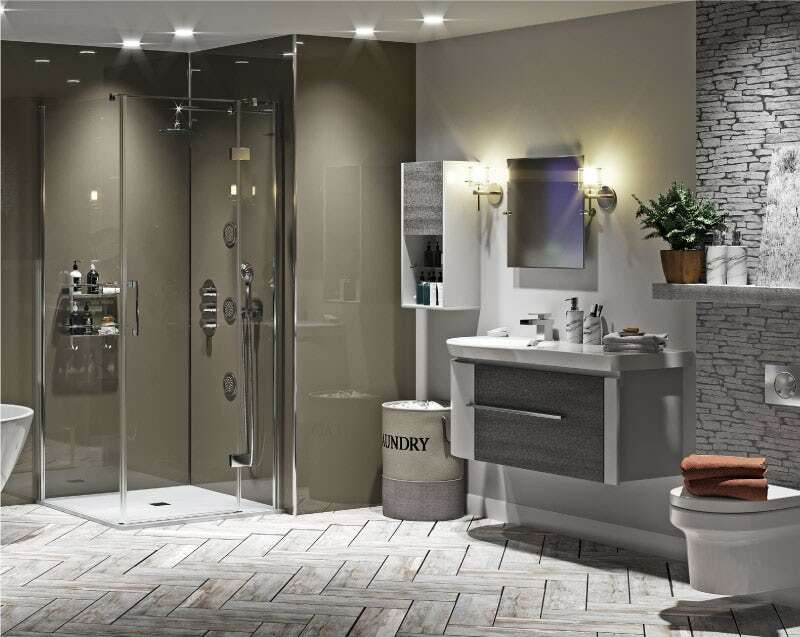 In this blog post, I’ll give you some great tips on how you can fake it, yet still end up with a fabulous contemporary style bathroom that looks the height of luxury and relaxation. We’re thinking high end here, highly contemporary with no fussy embellishments. It’s precise engineering, featuring clean lines and defined shapes, although with more rounded shapes to provide a softer appearance and “soften the edges” somewhat. Using slightly darker tones, the colour palette is still quite neutral and monochrome, utilising plenty of on-trend grey in various shades and a slight touch of olive green for contrast. See my mood board below to get a better feel for the overall look. A number of different materials have been used throughout to bring that more natural feel to the fore, including wood effect flooring, stone effect wallpaper and stone effect furniture. Plant life will also bring a more organic feel in its own way and we have complemented the greenery with green shower wall panels for a clean, defined look. 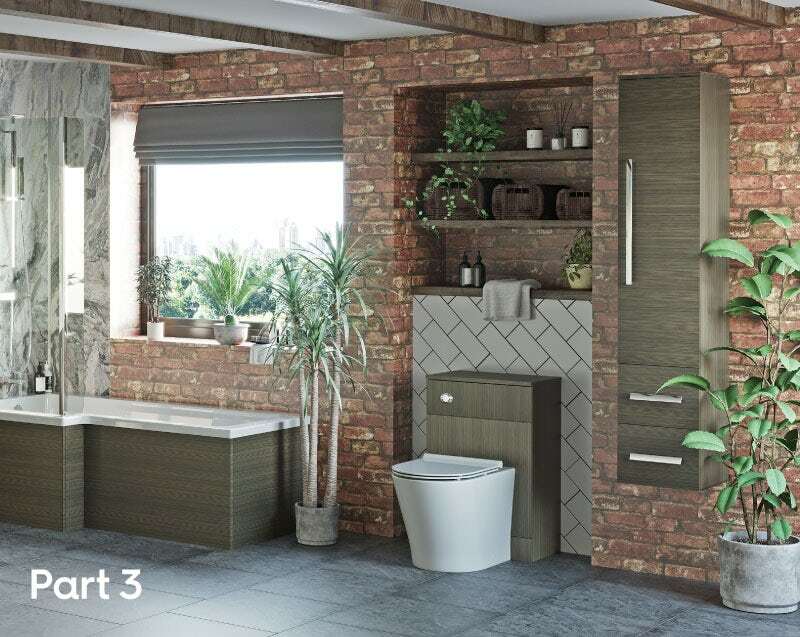 Now you’ve started to get a feel for the type of bathroom we’re trying to create, here are some of my own top tips to help you on your way. 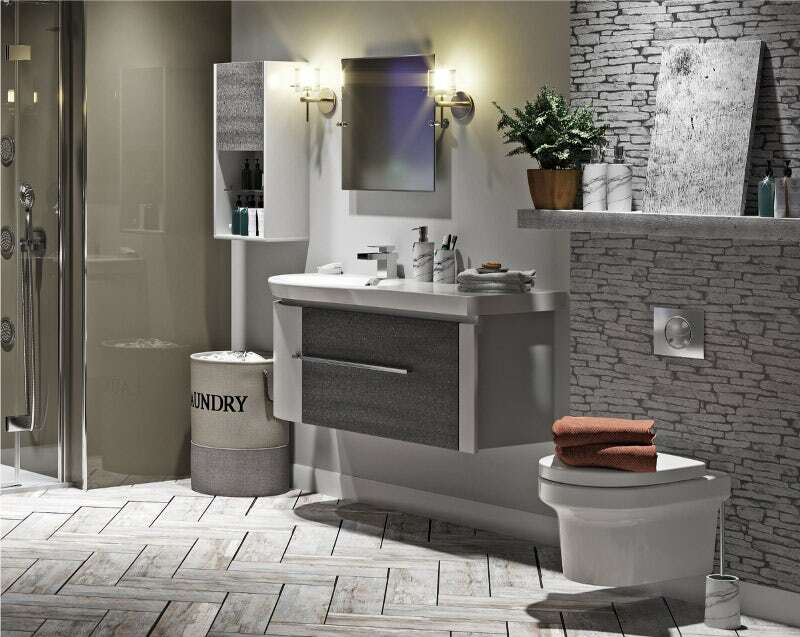 Contemporary bathrooms normally come with a monochrome or neutral colour scheme with plenty of grey added into the mix. Pick a couple of key materials to focus on. In our bathroom, we’ve focused on stone and wood, although you could pick marble, tile, ceramic or a whole host of others. 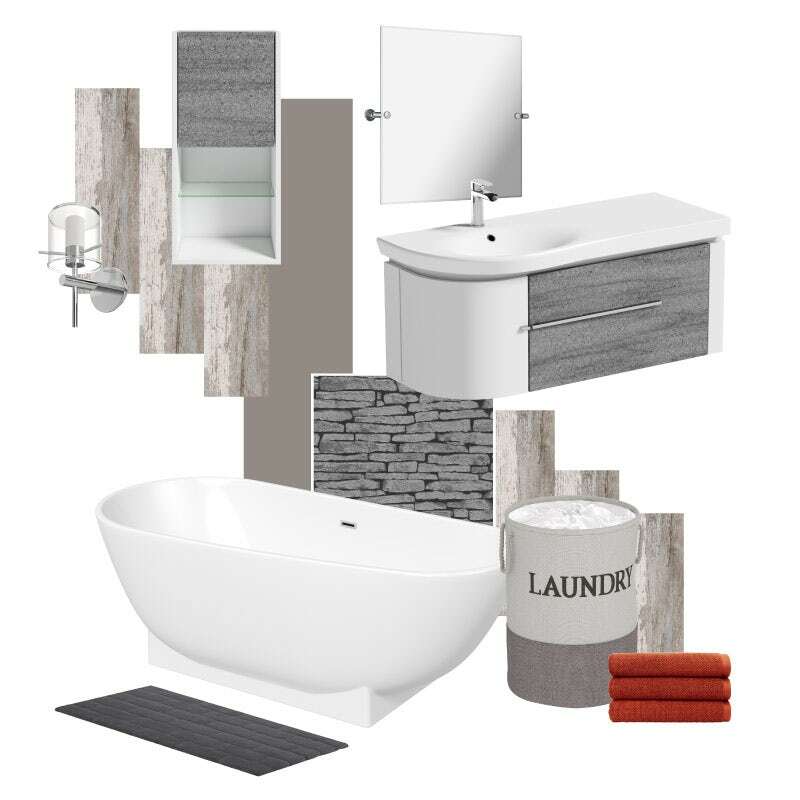 We’ve kept with the grey theme by choosing bathroom furniture with grey ice stone fascias, plus the grey stone effect wallpaper, all complete with a grey stone effect tile as an accessory piece. The wood effect flooring, which is actually hardwearing laminate, is also grey in an intriguing herringbone pattern. We’ve also added some subtle grey accessories such as the bath mat, laundry basket, soap and lotion dispensers, tumbler and toilet brush and holder. 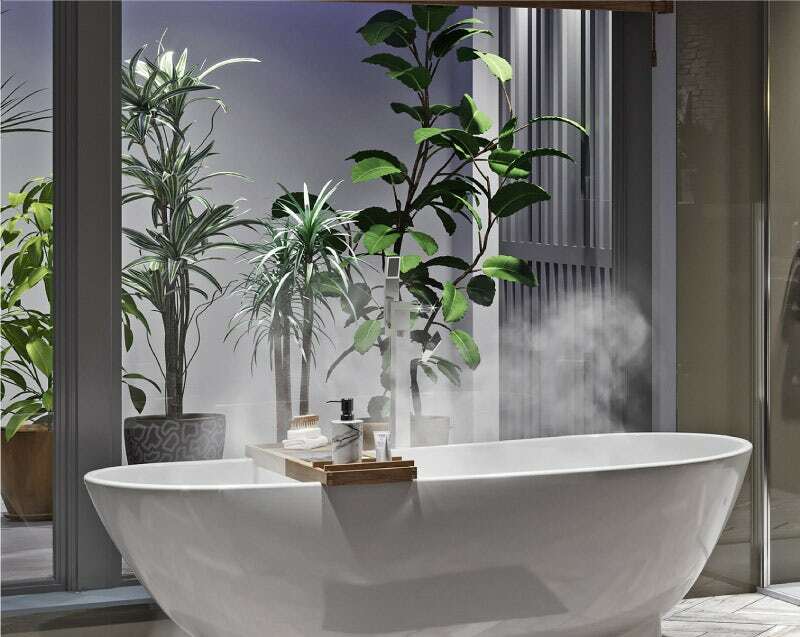 A key design trend of the past couple of years has included adding plants to your bathroom, and it will be more popular than ever in 2019. We’ve incorporated a number of larger potted plants to create a more tropical bathroom look, whilst smaller, selected succulents have been added to spare surfaces where possible. Handy hint: Don't forget to check out all our other on-trend "Get the look" bathroom style guides. To take the harsh edge of what could be a quite severe look, add products which feature rounded shapes, like the bath, toilet and vanity unit. 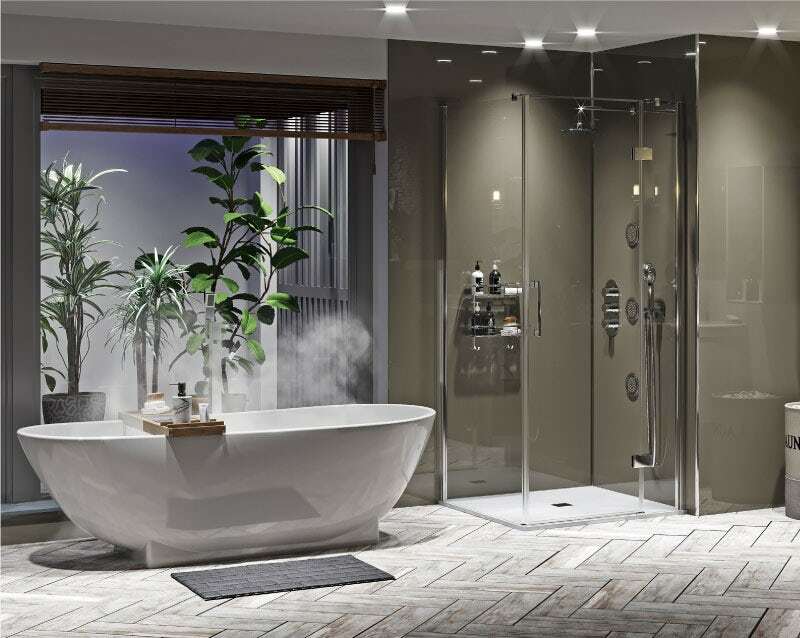 Whilst a square shower enclosure has been used to fit snugly into the space available, round shaped head, handset, body jets and valve all match the look. Downlights help to produce a clean, minimalist appearance, whilst bringing illumination to every corner. Supplement with contemporary wall lamps for added task lighting. Handy hint: Discover the most illuminating bathroom lighting ideas for 2019. If you like the look of this design, you’ll discover each and every item used within it right here at VictoriaPlum.com. Simply click on the banner below to browse products. If you like to make a bold statement with your interiors, check out part 3, where I’ll demonstrate how to create a more dramatic yet darker setting, complete with organic materials. Simply click on the image below to read more.